The Ring was made of gold and gold continues on its journey thru lands of evil fiat empires, guarded by Ringwraiths hell bent on gold's destruction. We at Thirdeyeopentrades guard the secrets, weaving our way thru the darkness of night clenching fists of gold tightly as we evade the Dark Horsemen. Armed with powerful moving averages and other technical indicators, we aim to protect our wealth as the empires of fiat destroy vast worlds of currency they create and manipulate. We'll share just a few of those secrets inside. Settle in with your favorite mug of grog, and enjoy the story we shall tell; another chapter woven in gold's bull advance thru lands of peril, greed and corruption. Gold began its bull market when Gordon Brown sold half of Britain's gold at an average price of $275.60 an ounce. That was the bottom. Today we hear multitudes of talking heads proclaiming gold to be "in a bubble". Hardly. In fact, gold remains undervalued. It doesn't buy enough stuff. Yet. We've seen projections for gold to reach its bull market highs near $10,000 an ounce. Once upon a time, that seemed implausible. Today, it's not so far fetched a projection. Thirdeyeopentrades remains of the opinion that gold should reach $3,000 or better before it's all said and done. Perhaps, much better. During the accumulation phase one shouldn't be too concerned with gold's price. Instead, one should focus on the weight. It's not how much gold costs, it's more about how much one holds. There are numerous ways to hold gold; paper and physical choices abound. Gold stocks are one leveraged way to hold gold. But none come without the risk of violent pullbacks enough to make one cringe and wonder if holding fiat currency might offer a better night's sleep. Don't count on it. You see, fiat currency is the real bubble. Gold is real money. Gold will never, ever go to zero. You can't say that about paper with President Profiles printed on it. Our paper currency isn't money at all. It is merely a debt instrument issued by a private banking cartel. That ought to help you sleep at night. This weekend, at Christmastime, we can feel the Misty Mountains trembling. We think gold is ready to launch once again. Our target was recently raised to just under $1600. While many see a double top along the $1425 or so area, we see rather an ascending bullish triangle consolidation with a small falling bull wedge inside. Time has offered gold the opportunity to essentially move sideways in price while MACD and Stochastic indicators have reset away from overbought areas. Thirdeyeopentrades added to our gold-based positions recently near $1365. You can see that gold has been following its 150 day exponential moving average for quite some time so that area offers strong support. If we're incorrect in interpreting present signals pointing to an immediate advance in price, then the next place we could see gold turn upward would be near $1350 or, in the worse case scenario, $1300. Zooming in on the falling bull wedge inside the larger bullish ascending triangle consolidation, we see what appears to be a 5 wave move off the high underway. Now, our speculation is for a contracted 5th wave pivot low to appear somewhere around $1270 - but that doesn't necessarily have to occur. What might occur instead is a lower 5th wave pivot low, somewhere near $1350 instead. But, we do suspect a significant pivot low is within hours or days of occurring from which gold will advance once again toward taking out the previous high and move toward our $1598 target. The markets are indeed final arbiter, so we'll have to see how things play out. But we are positioned for a move higher. PMPIX is a 150% leveraged gold stocks fund and this chart offers a couple tools we use to time better entries and exits. 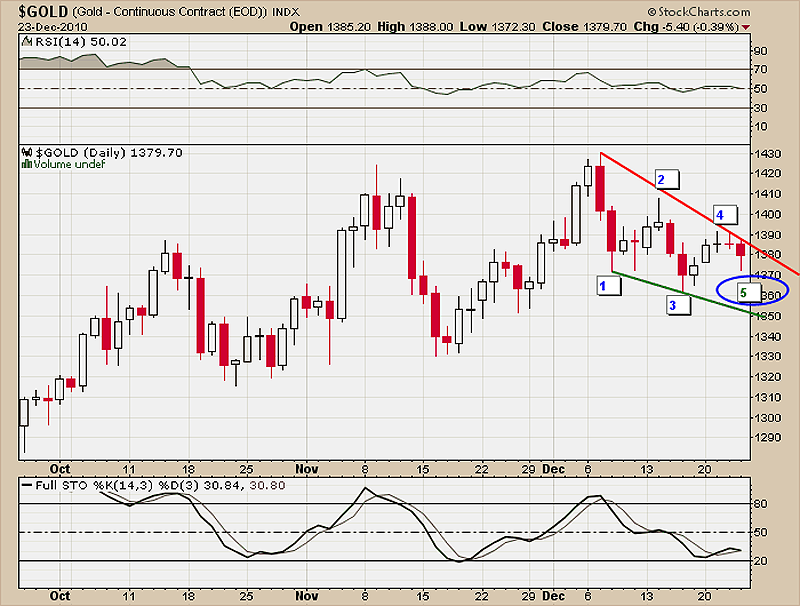 Its recent consolidation off $48 is similar to gold's. If gold launches right away next week, say by Tuesday (Monday's tend to be weak lately), then we would expect PMPIX to do the same. As you can see, its relative strength indicator remains essentially above 50 and we have found appropriate places to add shares each time during its bullish advance along stochastic indicator lows. It's a simple tool, always a candidate for failure as no tool is "perfect", yet works pretty well. Obviously, we're speculating a breakout may be on deck and added shares on Wednesday's dip with the stochastic hitting 20 (right inside the green zone). 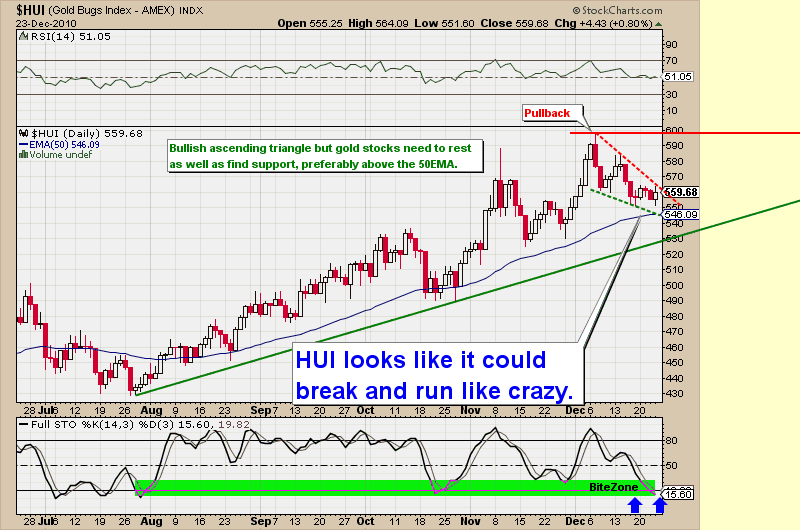 The HUI Gold Bugs Index is a chart many watch so this essay wouldn't be complete without a review of that. As you can see, the HUI has carved its own bullish ascending triangle. A similar bullish falling wedge resides within. Historically, price likes to find support along the 50 day exponential moving average, sometimes carving a low somewhat underneath it. 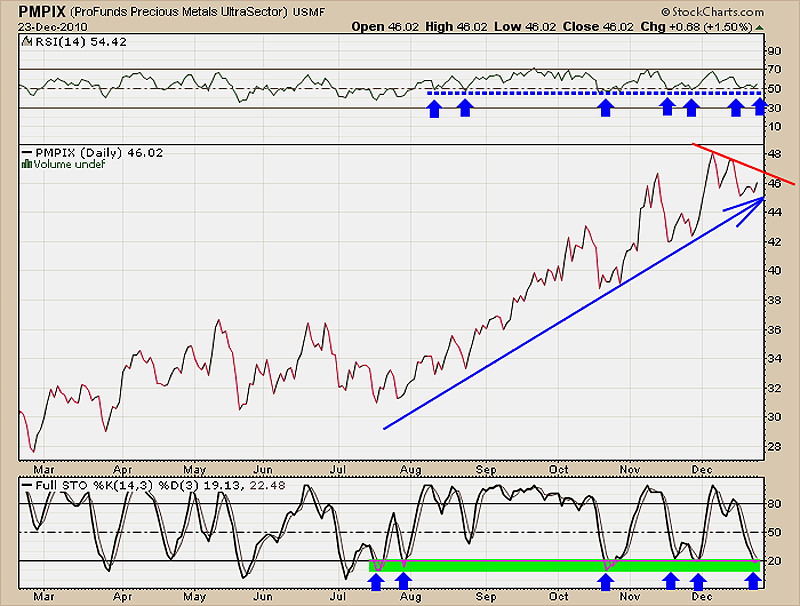 The stochastic has entered the bullish zone and relative strength continues to find support along 50. Set-ups generally don't get any better than this. We anticipate an upward thrust in prices to be moments away. 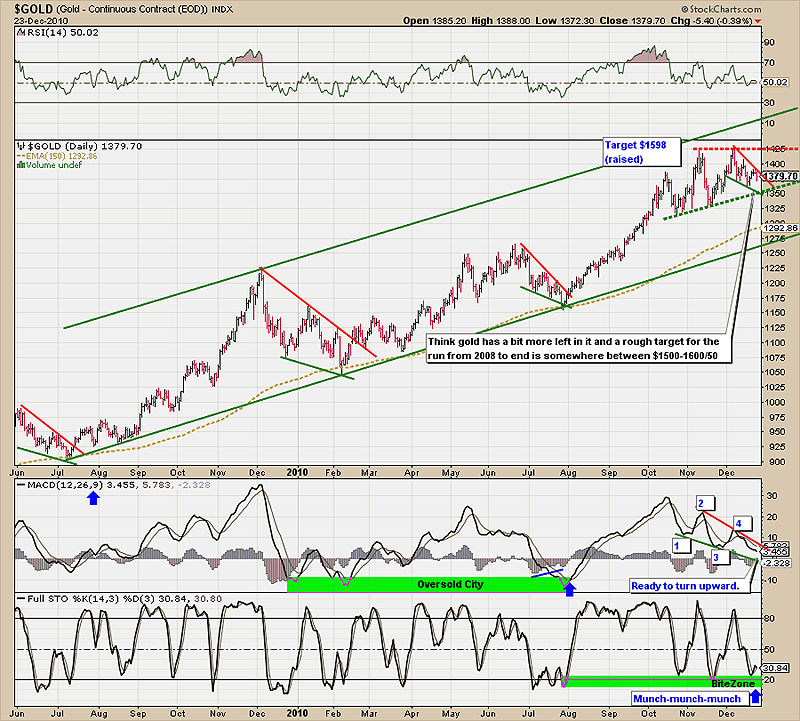 We understand that gold stocks sometimes delay their moves a bit to frighten off timid Newbie's, so there remains the possibility that price could test the rising green support line and the pattern still be bullish as any. SIL is consolidating above support and its stochastic indicator has entered our "bite zone". 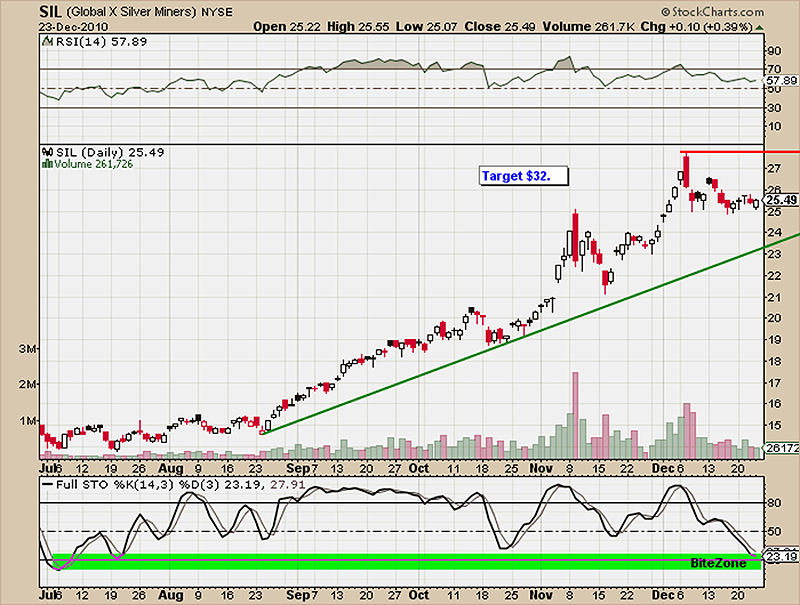 We suspect silver stocks could really move too rather soon. So that does it. It's looking like they're ready to go once again. As we started the essay with references to Lord of the Rings, in case you're a fan there are a couple free online Fan Movies which may be of interest and they're remarkably well done. We hope you enjoy the movies and Happy New Year!